Adrian Peterson will be skipping out on the Pro Bowl this year. Adrian Peterson has always enjoyed playing in the Pro Bowl, even deciding to play in the annual exhibition despite injuries and having sports hernia surgery after playing in the game last year. This year, the Minnesota Vikings’ running back decided to take it easy. Peterson, who has been named to the Pro Bowl in six of his seven NFL seasons, withdrew from the Pro Bowl. Green Bay rookie running back Eddie Lacy was named to replace Peterson. Minnesota will only be represented in the game, as of now, by rookie returner Cordarrelle Patterson. Peterson, who was the only Vikings’ player selected in the initial voting, played through a sprained right foot and injured groin at the end of a season in which he ran for 1,266, which ranked fifth in the NFL. 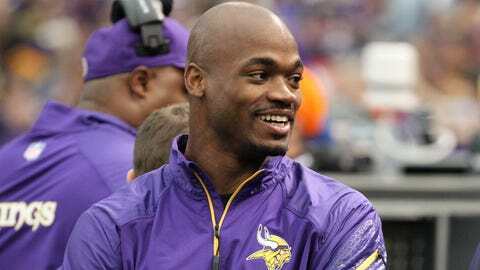 In his follow-up to his 2,097-yard, MVP season last year, Peterson also dealt with a hamstring injury. His 11 total touchdowns were tied for sixth in the NFL. Peterson was named the Pro Bowl MVP as a rookie in 2007.